The aim of our studies is to incorporate new control practices in seed potato production to reduce the use of inputs including pesticides and to preserve the ecosystem. The innovations we target are intercropping management, varietal resistance, tools for assessing the health status and alternative practices to the use of pesticides. Practices identified in the literature, and through field surveys, etc., are evaluated in field trials. Further experiments are conducted under controlled conditions to understand the effects of the different practices on the epidemiological traits of the pathogens. 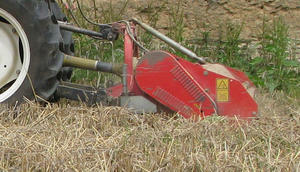 Grinding wheat residues in an experimental plot. and more generally, integrated control strategies for one or several pathogens.